For a long time, there had been very little research to support the benefits that many parents claimed that baby-led weaning had for their child. As interest in BLW has grown and the approach became more popular, more studies are looking at the connection between a child's first foods and their health, development and eating behaviours. I've compiled a lot of this information at Benefits of Baby-Led Weaning, if you're deciding with which path to take. And today, I've created an infographic which summarises the highlights and may help you make your decision! Why introduce solids with baby-led weaning? Baby-Led Weaning Benefits [INFOGRAPHIC] - Click for full-size! Ready to start baby-led weaning? 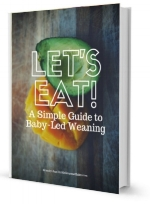 Get the ebook Let's Eat: The Simple Guide to Baby-Led Weaning. Let's Eat is packed with information, tips and a quick-start guide - everything you need to know to give your baby a nutritious start to solids, the baby-led weaning way. Newer PostFirst Foods Fundamentals: A Free BLW eCourse!